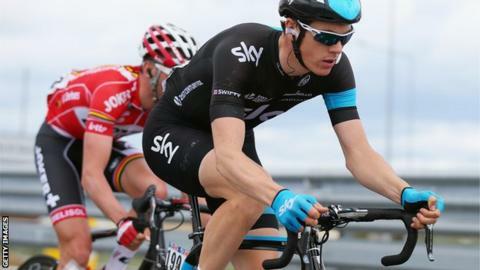 Britain's Ben Swift was beaten into second by Frenchman Arnaud Demare in a sprint finish in the prestigious Milan-San Remo one-day race. The Englishman, who finished third in 2014, was less than a bike length away from being Team Sky's first-ever Spring Classics winner. The diversion on to the A10 bypass increased the race - already the longest of the Spring Classics - from 291km to 300km. The race was dogged by a number of crashes involving high-profile riders, including Team Sky's Thomas, who was among the favourites after victory in the week-long Paris-Nice stage race earlier this month. Both riders picked themselves up but struggled to get back into contention, while the 2009 winner, Manxman Cavendish, saw his challenge fall away on the Cipressa's punishing ascent. Former British road champion Ian Stannard of Team Sky and Movistar's Giovanni Visconti took advantage of further crashes on the narrow coastal roads to open up a 20-second gap on the descent, but were then reeled back on the gruelling Poggio di Sanremo. Poland's former world road champion Michal Kwiatkowski made an early bid for victory going over the Poggio's summit, but the Team Sky rider was caught with a kilometre to go by a group including favourites Vincenzo Nibali (Astana) and Peter Sagan (Tinkoff-Saxo). Isle of Man-based Swift looked like he had made a decisive break for the line, but it was unfancied Demare (FDJ) who stepped out of his tracks to round the 28-year-old and Belgium's Jurgen Roelandts (Lotto-Soudal) to become the first Frenchman since Laurent Jalabert in 1995 to win La Classicissima.